Yesterday was a special treat because we had riding companions. We met Andy and Nora (photos will be at the bottom–no wifi as I draft this) in the self-catering kitchen at the hostel in Canterbury. They were carrying their handlebar bags, so their status as cyclists was immediately obvious. We geeked out over routes and equipment, then shared our pesto sauce. They asked if we were interested in riding together, but we initially declined due to our own perceived slowness. We later reconsidered and in the morning asked if they would like to ride together for a while and see how it went. We’re glad we did. Having four sets of eyes to look for the sometimes tiny route markings was a definite advantage, and we were also able to converse during much of the ride. Did I mention that Kent is hilly? This was the hilliest day yet. We did 1400 feet of climbing in about 22 miles, and none of the climbs were very long. Some were steep though, and some had trucks with scary trailers that passed more closely than I would like. 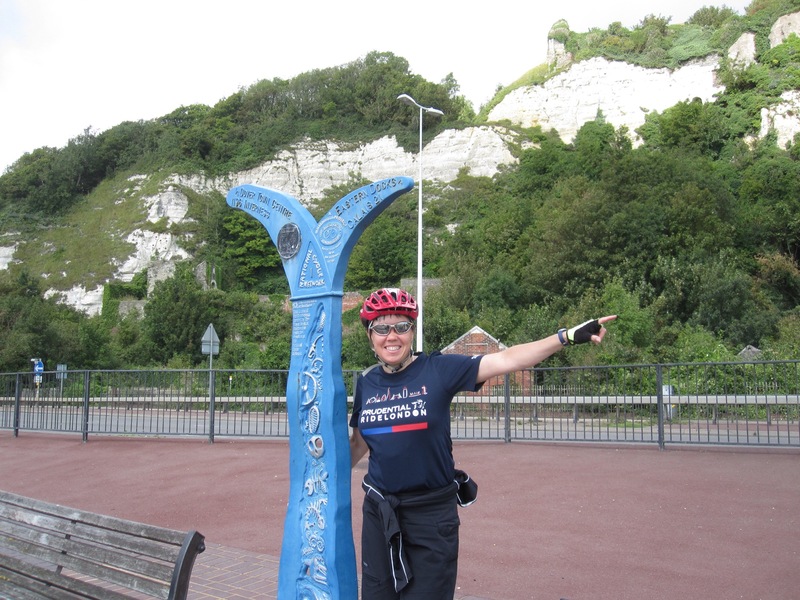 This was National Cycle Route 16 to Dover directly–route 1 goes via Sandwich and Deal and is much longer, so we opted for the shorter route. It was a very beautiful ride through the countryside, despite the hills. The final portion of the route is a steep drop from the castle to the sea. Whee! 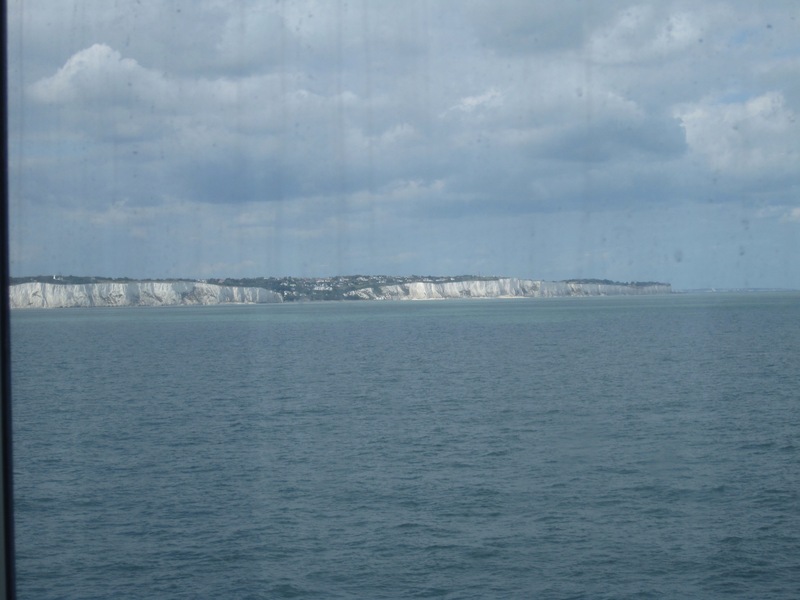 When we reached the Channel, the famous white cliffs were visible (photos below), as were the ferries. We had booked a 4:40 pm ferry, but decided to see if we could go earlier. Getting to the ferry was an adventure in itself. You can see it, but you can’t quite get there from here. 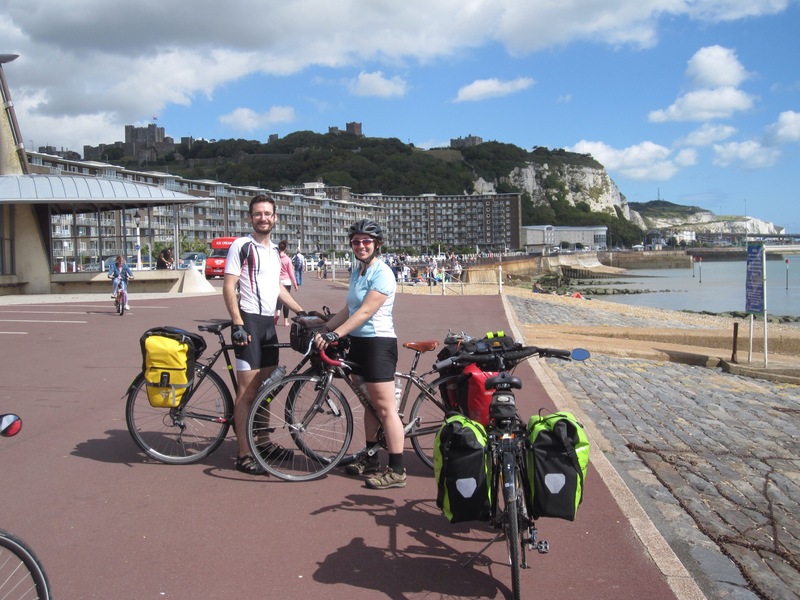 We rode up towards the cliffs, then circled back into the port. There was construction, so they had painted a red line for cyclists to follow (quite nice of them). We passed through passport control and customs still on our bikes (a new experience, but totally unremarkable to the agents) then were directed to a small building to get the actual tickets. We parked (and locked) our bikes outside, then went to the desk inside. Apparently we were not supposed to be able to go 3 hours early, but somehow it got approved. They gave us tickets and a lane assignment for the 1:55 ferry. The next task was to ride through to our lane, 214 (out of 220 or so), and then wait for further instructions. This was another time to be glad that the weather was good. Unfortunately, people do smoke and run their Diesel engines while they wait, so it’s not particularly awesome to be on a bicycle. 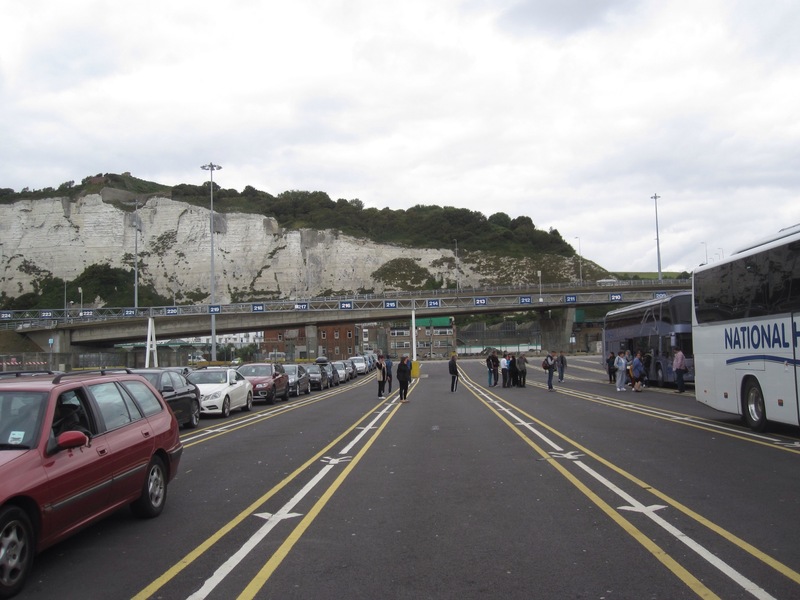 Once the ferry arrived and passengers and vehicles were debarked, the loading process started. We were allowed to ride up the ramp before the cars, caravans, and trucks, and were directed to racks at which to park our bikes. More places should use the style of sturdy racks they have–they had no trouble holding our heavy loaded touring bikes. We locked everything as securely as we could (there was no way we could haul everything up to the passenger decks) and headed upstairs. Thankfully, the vehicle bays are closed during the voyage, so (in theory) no one can interfere with your stuff, though it was still a bit nervous-making to leave the bikes and panniers. We had a simple meal of chicken and mushroom pies in the food court and whiled away the rest of the 11/2 hour journey. 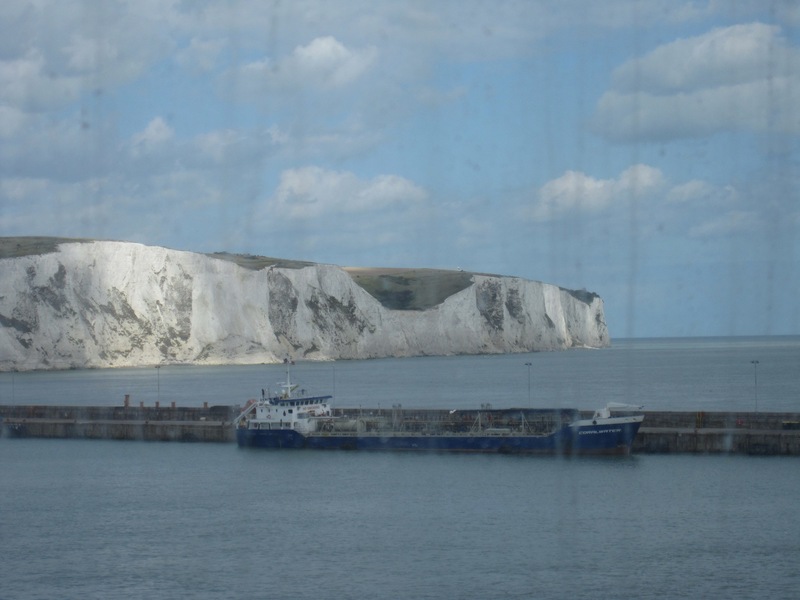 Debarkation was about as unclear as embarkation. We ended up being last to get off, which was fine as it meant we had no traffic to worry about in getting out of the port. We made our way to the hotel through fairly sketchy areas, and I was quite relieved that we had been able to board an earlier ferry.